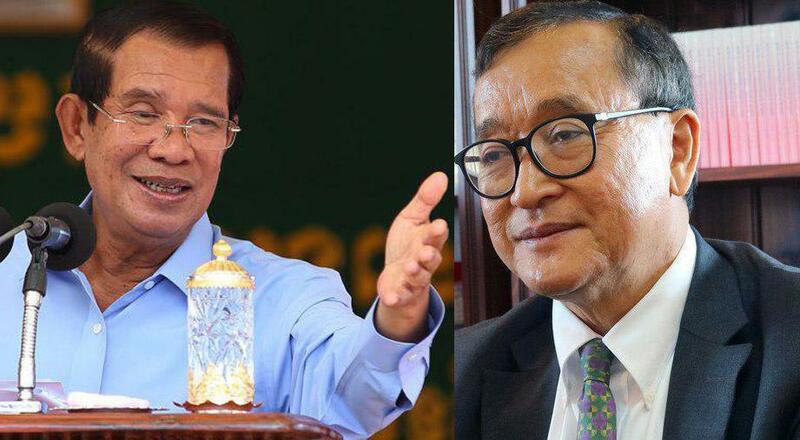 Phnom Penh (FN), Feb. 22 – Former Cambodian opposition leader in exile Sam Rainsy announced to cancel the bet with Cambodian Prime Minister Hun Sen, according to Rainsy’s Facebook post on Wednesday. Fresh News, as a witness to the two parties, implied Rainsy’s cancellation a “give up” that resulted in the loss to Premier Hun Sen. The convicted Rainsy also broke his own promise in repatriating to the kingdom and entering the prison. Rainsy spoke in an interview with Radio Free Asia on 15 February 2019 that he will not return home as promised, but will repatriate at any appropriate time soon. On 9 November 2018, Rainsy dared the premier to resign if Sokha released; if not, Rainsy himself will return home and be arrested. Sam Rainsy bet with Premier Hun Sen that Kem Sokha will be released in between 29 December 2018 - 3 March 2018, as he believed that Sokha’s pre-trail detention will end no later than 3 March 2019. 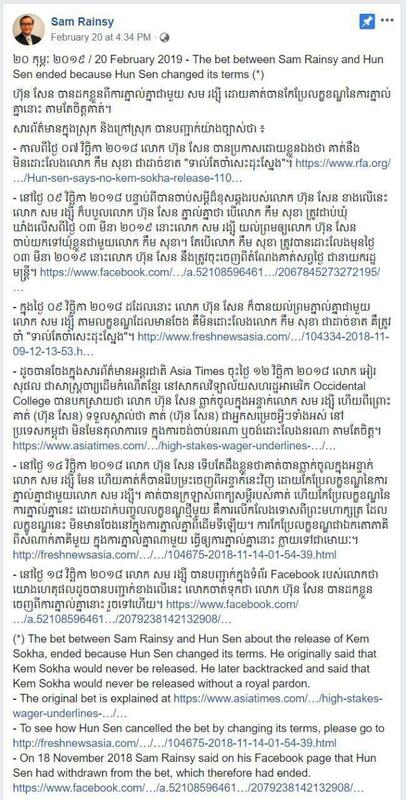 Prime Minister confirmed shorty in an exclusive interview with Fresh News CEO Lim Chea Vutha that: “I bet with Sam Rainsy” and asked the media outlet to be the witness. Analyst Chao Chak Smuk said a few days after the bet that Rainsy is just a coward who always broke promises; the coward is good at lying.